The Popular Online Poker Room's Holiday Season Activities Will Feature $50,000 Winter Edition Promotion. Titan Poker's holiday season activities will appeal to all poker players, no matter what their playing preferences are. 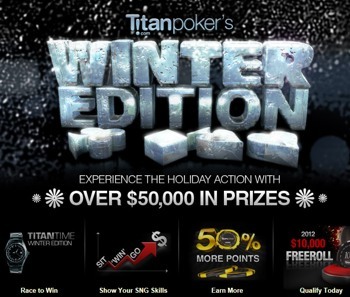 Leading online poker room in Europe, Titan Poker will stage a 2-month Winter Edition promotion awarding online players with more than $50,000 in cash prizes during the holiday season. Winter Edition will appeal to all types of poker players. Those who prefer cash game action can compete for their share of $24,000 in prizes in the weekly Titan Time Cash Games races, which rank players based on their activity at those tables. Every week players will have a 3-day cash tables race to compete in with a $3,000 prize pool up for grabs. All they have to do is generate the Points and collect the cash. Players who prefer the fast-paced action of sit �n� go tournaments will find a calling in Titan Poker's Sit �Win� Go leaderboard races. Grouped by activity in sit �n go tournaments according to buy-in amounts, players will compete for a share of $24,000 in total prizes. The leaderboards rank poker players based on their finishing position in each tournament. The 6-day races kick off every Monday during December 2011 and January 2012. Talent wins games, Determination wins races! Titan Poker's popular Happy Hours promotion continues during the winter months, awarding players with 50% extra Points for their gaming at cash game tables on weekend nights after 20:00 GMT. These Points can be redeemed into cash bonuses and tournament entries at the Club Titan Store on the room's website. As part of Winter Edition, Titan Poker room will ring in the 2012 New Year with a $10,000 Freeroll tournament. Players can qualify for a seat at this event by earning a minimum of 250 Points during the month of December this year. The Freeroll will take place on January 2nd, 2012 at 19:30 GMT. You can find the tournament "2012 $10,000 Freeroll� in the Titan Poker lobby by selecting the "Special Offers" tab. Poker novices and veteran poker players alike are invited to try out the free poker download at Titan Poker and win their share of more than $50,000 in prizes this winter at Titan Poker. Titan Poker is the number one online poker room in Europe and part of the iPoker Network. Titan Poker's software is developed and maintained by Playtech, a public company and leading online gaming software developer. With tens of thousands of online players at peak hours, Titan Poker guarantees millions of dollars in monthly prizes, offers an easily redeemed 1st deposit bonus, features special SNG tournaments with progressive jackpots as high as $300,000, and awards active players with entries to major worldwide poker tournaments.